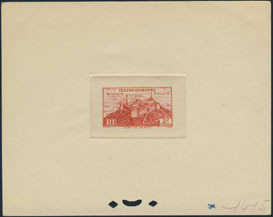 16638 ESS FEZZAN (1946) Sebha fort*. Trial color die proof in red with color code in margin. Scott No 1N5, Yvert No 32. Only 3 issued in this color!